"There was a time in this fair land when the railroads did not run", Gordon Lightfoot was not referrring to the present but to the time before railroads were built across Canada, but once again the statement is true. 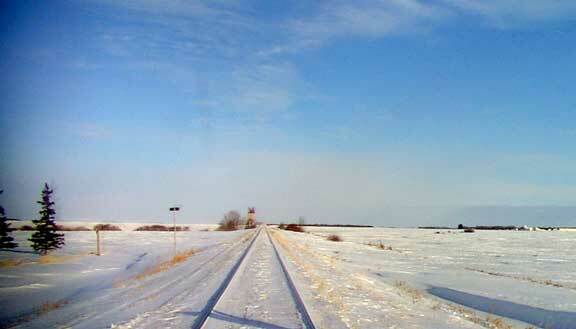 This rail line coming into Tisdale from the East once connected at Crooked River to a line that went to Bjorkdale, Porcupine Plain, Weekes, Reserve and connected to the line to Preeceville to Hudson Bay and the port of Churchill. But CN cut the link from Weekes to Reserve then last year removed the line from Weekes to Crooked River leaving newly refurbished Pool elevators at Weekes and Bjorkdale standing useless while a series of grain handling facilties at Porcupine Plain were also rendered unusable. The distance from the rich farmland well East of Weekes to Tisdale makes agricultural in those areas now less than marginal, when it comes to producing cash crops, farms that were once the envy of all farmers for their rich soil and high profittability are now just land that costs more to produce a product than the value of the product once you take off the excessive costs of truck transportation to the inland terminals around Tisdale, and then pay the excessive costs to transport the product to Vancouver. The solution is unavoidable, the farmers in the Weekes area have to have a valued added product to sell, grain can not pay the bills and so the development of monster pig barns will begin this summer. Ultimately, seven large facilities will be developed around the countryside, spread out to locate them near enough to large amounts of farmland that can absorb the waste materials and use it for fertilizer. Soil testing now completed, the specific sites revised to ensure that the ground water will not be contaminated by the lagoons scheduled for each of the facilities. The interesting problem of resistance to the development seems to be the cattlemen in the area, most of their farms are located along the Shand creek to provide them with a good supply of water and they are attempting to mount opposition to the pig barn projects. ,despite its heavy level of government subsidsation,. Weekes farmers had the opportunity to go to some of the big facilities and look them over. 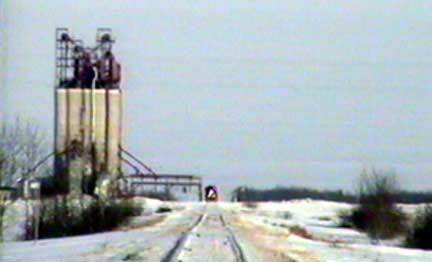 It is a certainty that the farmers in the Weekes area knew and understood the ramifications of rail line abandonment, the centralising of the grain handling facilities into the inland terminals and long before CN and the Wheat Pool ended service to that area it was obvious that their days as grain farmers were numbered. The commercial hog barns on the massive scale as those to built in the Weekes area bring with them a host of problems but the problems and all that they entail are a direct result of the political and economic decisions made by the grain handling industry.